Zodiac is known and recognized by professional experts as a partner of prestigious events and has won numerous awards. Join the Zodiac community, the brand that has already won the hearts of over a million owners! There are 12 footballers in this Zodiac boat, and it is capable of carrying more or manoeuvring, without taking water. This is because the buoyancy of a Zodiac boat is far greater than that of a traditional boat, giving it a higher loading capacity. The stability of a Zodiac boat thanks to its large buoyancy tubes which give it a low center of gravity, is such that under normal circumstances they are practically impossible to capsize. This quality, which is essential to safe confident navigating, is especially appreciated by drivers and fishermen. Storing a boat when not used can be difficult at times. Garage space may be limited, and transporting a fiberglass vessel requires a trailer and/or large vehicle. Because of the inflatable tube and collapsible floor of a Zodiac, many of our boats are able to be stored on a shelf or in a closet and transported in the trunk of a car. Our larger RIBs require less power to tow, as they are much lighter than the traditional fiberglass boat. Running a Zodiac boat requires smaller outboards than conventional boats to provide better performance thus saving you money when on the water. Their maintenance is straightforward and their resale is relatively easy with good residual prices, hence costing less when out of the water. With Zodiac, boating can be economical. Zodiac Nautic selects with care the materials that constitute its boats, following strict, nonstandard functional specifications. 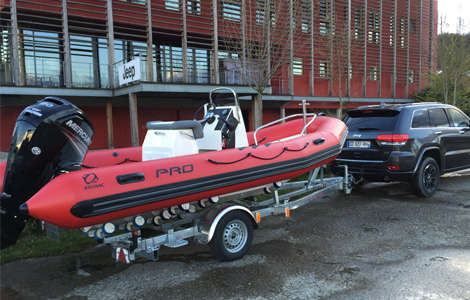 Zodiac Nautic is probably the only manufacturer to subject its new boats to a battery of tests in navigation in extreme conditions. Be sure of it, your Zodiac boat will follow you everywhere and for a long time to come. 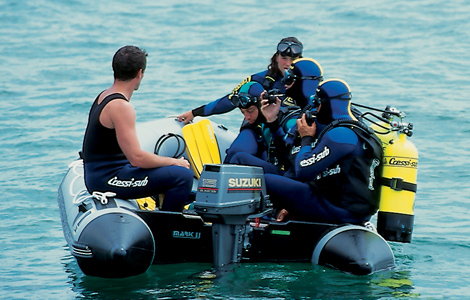 The inflatable boat consists of a floor, transom, fittings, and the tube. These iconic tubes make up a considerable portion of the entire boat, and are filled with air, resulting in a lighter boat. In fact, a Zodiac can be up to 3 times lighter than a comparable fiberglass boat, making transporting easier and more efficient.